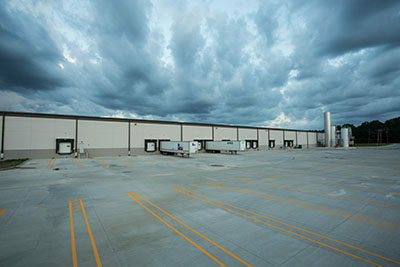 ARCO Construction Company Completes a Distribution Facility/Office for Premium Waters | ARCO Construction Company, Inc.
ARCO Construction Company recently completed a ±259,000 SF bottling and distribution facility with ±5,000 SF of administrative and shipping office in Hinds County, Mississippi. 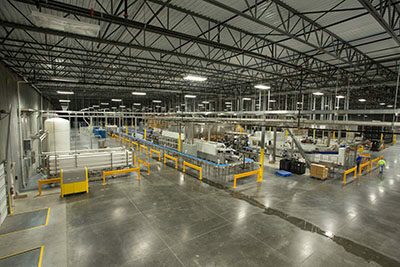 The facility includes one (1) bottling line installed as part of the initial construction, and is designed with capacity and planned space for two (2) additional lines based on projected market growth. The site design includes a planned expansion of ±148,000 SF, with structural/electrical tie-ins designed into and built during this phase of work. 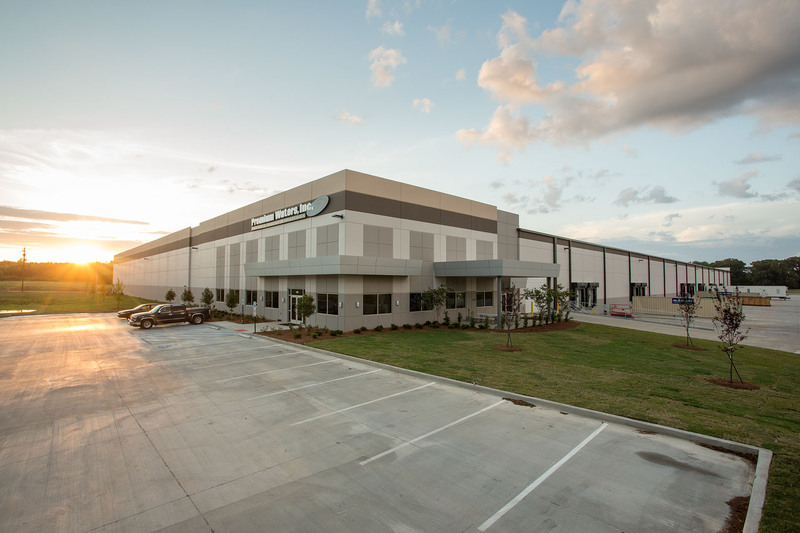 The Premium Waters facility is a 28’-clear height, load-bearing, tilt-up concrete wall building with a roof structure designed to accommodate specific route loading of piping and electrical distribution for the bottling process. The building has a white TPO roof with a 20-year manufacturer’s warranty. Shipping/receiving improvements include twenty-six (26) dock stations, each equipped with fully-integrated 45,000# capacity hydraulic levelers, truck restraint, and 9′ x 10′ dock doors with full dock shelter enclosures. To accommodate the incoming equipment for future bottling lines, the building access includes one (1) electrically-operated 20′ x 18′ drive-in door with 115 mph wind rating. There is a 6″ domestic water service to serve both general building use and the bottling operation. The facility has a substantial network of underground drainage lines and trench assemblies to allow ease of operating during cleaning and quickly allow water to drain in the event of spillage during any equipment malfunction. Bottling, filtering, and injection molding equipment all sit on isolation foundations. The exterior water storage silos sit on concrete mats with 55’-deep auger cast piles. Premium Waters is equipped with twin 4000-amp, 480/277-volt electrical services. 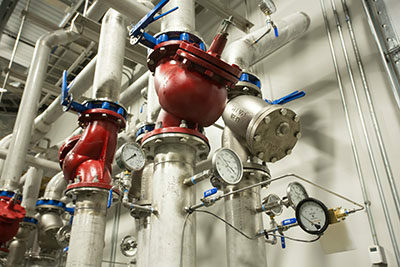 Throughout the building there is LED lighting, ESFR sprinkler fire protection, and supply/exhaust fans for evening ventilation and precooling of the building during night hours. The exterior of the building is striped with over one-hundred (100+) trailer staging stalls on a concrete parking lot with cement-stabilized subgrade. Along with the construction of Premium Waters – Jackson, ARCO Construction has also completed Premium Waters in Riverside, Missouri. 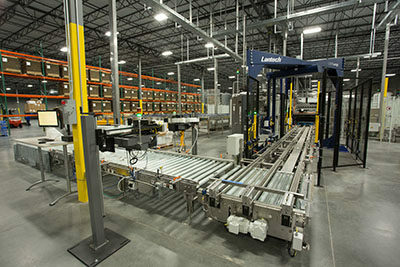 ARCO has expanded the Riverside facility, nearly doubling the size of the building and capacity of that plant. 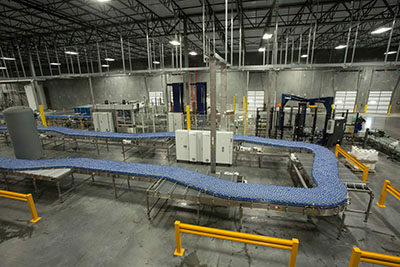 ARCO has also constructed a spring water facility for Premium Waters in Basswood, Missouri. ARCO’s comprehensive design|build approach provides clients with streamlined communication through ARCO versus a number of different organizations. This relationship provides the advantage of accountability resulting in both time and cost savings. 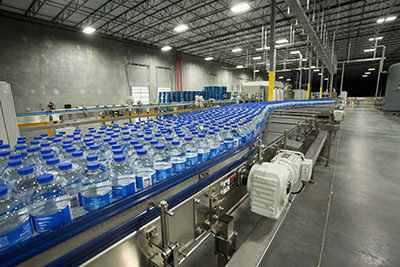 As a bottling company, Premium Waters, Inc, holds maintains high standards when it comes to producing bottled water. They have extensive purification processes in place that includes sanitization and testing methods. All of Premium Waters products meet or exceed FDA and EPA standards. They bottle products such as Chippewa Spring Water, Glacier Clear Purified Drinking Water and many more brands. They strive to be part of consumers healthy lifestyle and pride themselves on their thorough bottling process that allows them to produce a quality product.